Length: 8.5 Miles. Moderate to Strenuous. Approximate Time: 6-8 hours. Nestled against the granite wall that forms the Eastern face of Longs Peak, pristine Chasm Lake is a truly spectacular sight to behold. Getting there is pretty incredible too. 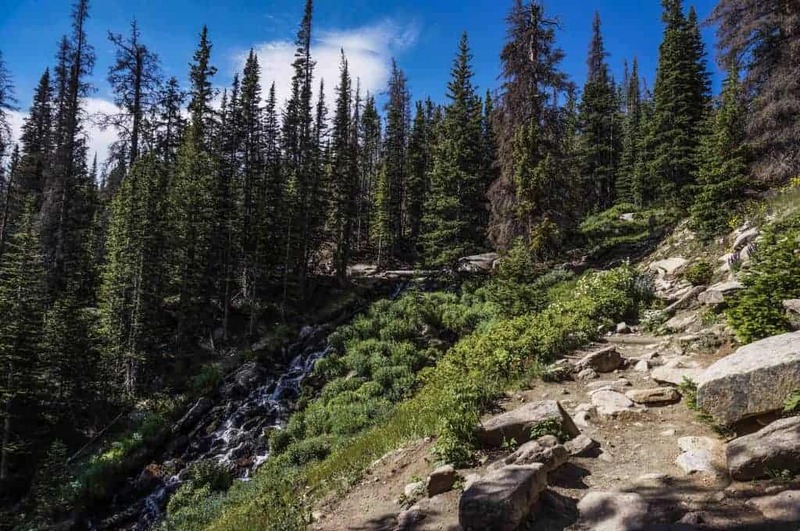 The trail climbs gently through varied terrains, offering spectacular views, waterfalls, and plenty of marmot sightings. This hike is only steep and moderately technical in the last half-mile or so; the rest of it should be quite manageable for most fit(ish) hikers. 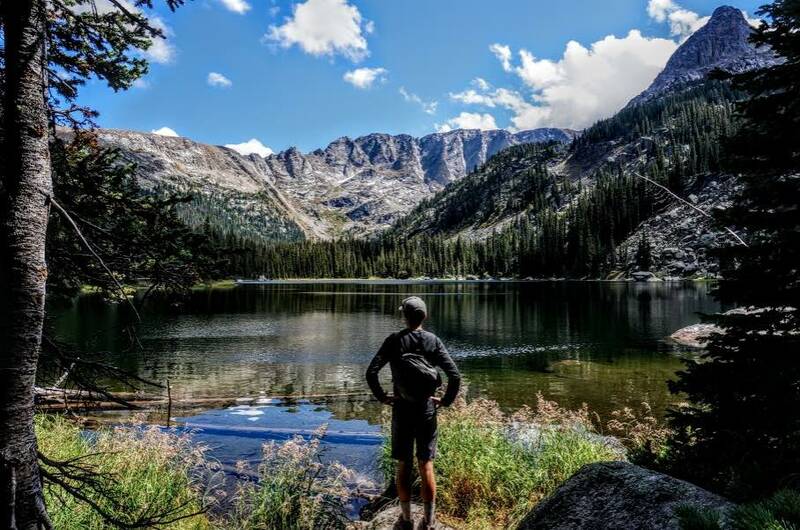 This hike starts at the Longs Peak Ranger Station in Rocky Mountain National Park, which is accessed via CO-7, either from Estes Park or Allenspark. If you are coming from the Front Range, head to Lyons, then turn left onto CO-7. Stay on that road past Allenspark, and keep an eye out for signs for the Longs Peak trailhead. When you see the turn-off (just after you enter into Larimer County), take a left. You’ll follow this road until it reaches the ranger station and trailhead. If you are hiking on a busy weekend or holiday in the summer, expect to park along the road, as the lot fills up very early. 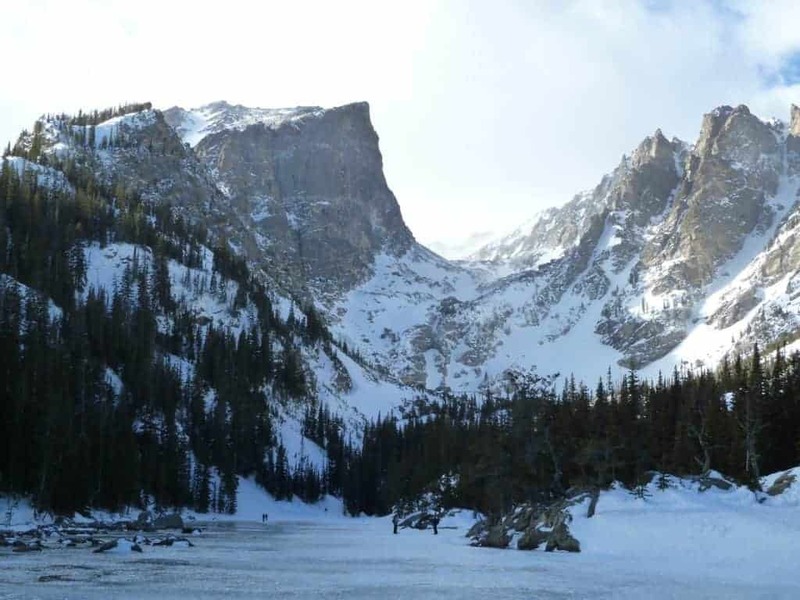 Although the hike is within Rocky Mountain National Park, visitors do not need to pay an entrance fee at this location. 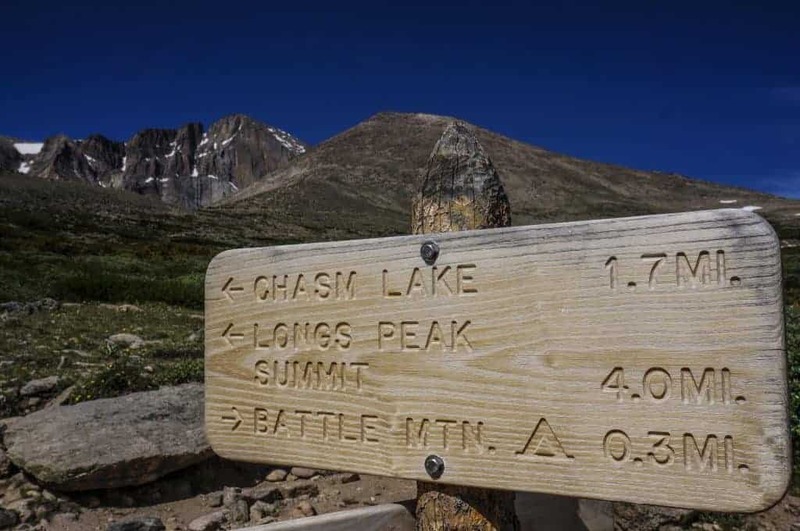 Begin your hike by following the East Longs Peak Trail. You’ll be on this trail for most of the hike, and all of the junctions are very well marked. For the first mile or so, you’ll climb at a mellow grade through lovely pine forests. At the first junction, follow the signage and veer left. From here, you’ll traverse a few switchbacks as you start to see and hear a stream that courses alongside the trail in several places. A bit higher up, you’ll cross the stream (there is a bridge), and the views open up towards the forest below. This peaceful, shady spot is a great place to stop for a snack or a short break. As you keep hiking past the stream crossing, the pine forest dwindles until the only trees left are krumholz, the short, wind-sculpted trees found at higher elevations. As you get above treeline, the views really open up. The first stream crossing en route to Chasm Lake. Looking to the east, you get big vistas of the entire Front Range, and to the west Longs Peak looms large. The rest of the hike winds through alpine tundra. Make sure to keep an eye out for the wide array of delicate and colorful wildflowers that dot this landscape in the summer months. The trail continues to climb steadily (and a bit more steeply) until it reaches the next junction at about mile 2.5. The right-hand fork will take you up Battle Mountain, while the left will continue towards Longs Peak and Chasm Lake. After another mile, you’ll reach a rocky ridge. There’s an outhouse here, and this is another nice spot to take a break. 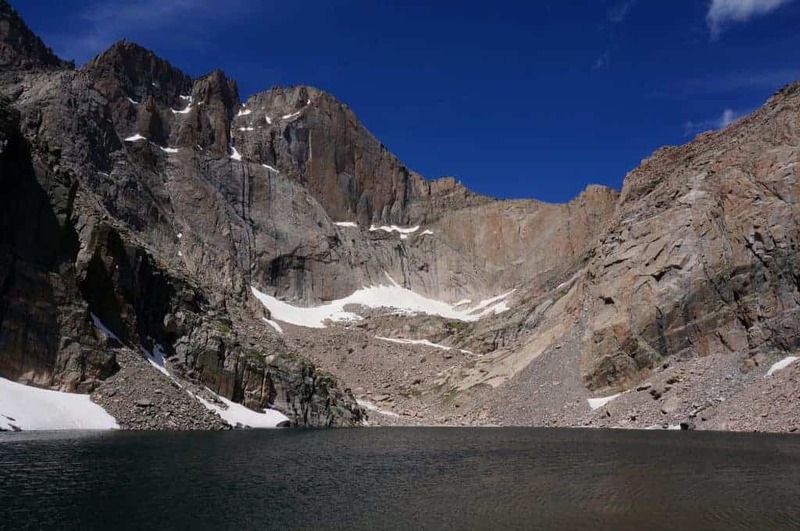 This is where you’ll leave the Longs Peak Trail (that’s an adventure for another day), and make your final push towards Chasm Lake. From the junction, the trail hugs the side of the ridge, narrowly in some places, as it curves towards the lake. We hiked in late June and encountered a small amount of snow in this section. While it wasn’t too difficult, traversing the snow on this narrow section of trail might be a bit unsettling for some hikers. Use hiking poles and keep your weight leaned in towards the mountain, and you should be just fine. As you approach Chasm Lake, you’ll be treated to stunning views of Peacock Pool and Columbine Falls. Just before reaching the lake, you will encounter a steep section that contains large boulders. You’ll need to do some scrambling in a few places, but this tricky section is very short (and very fun!). Spectacular Chasm Lake is waiting for you at the top. Grab a seat on one of the many large rocks ringing the lake, relax, and enjoy this beautiful little pocket of earth. Make sure to head down early enough in the day to avoid being above tree line when afternoon thunderstorms roll in. We capped off this perfect summer day with a post-hike ice cream outing, and we’d highly recommend you do the same. The final approach to Chasm Lake. Enjoy the breathtaking views of Longs Peak! If hiking in June, check the snow conditions before you go. July and August are the best months to complete this hike. The alpine section of this hike is quite exposed, which makes it a dangerous place to be in the event of a thunderstorm. Start early to avoid getting caught up there when weather moves in. 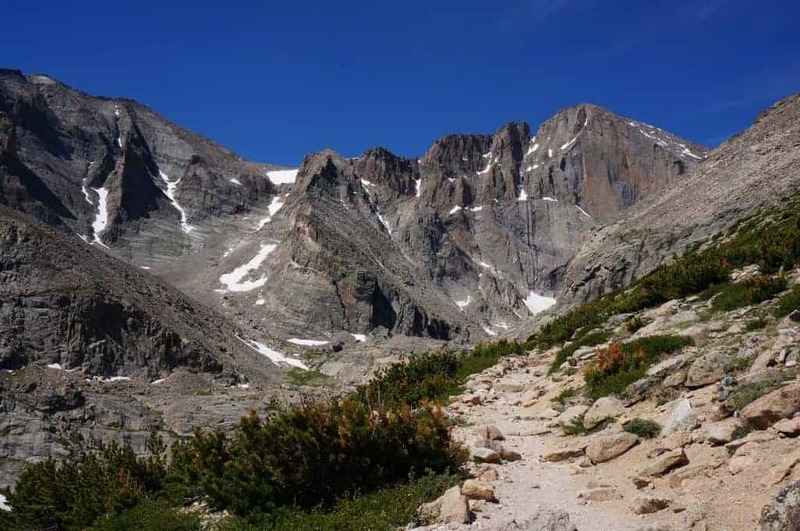 If hiking on a weekend, plan for an extra mile or so of walking along the road, as the parking lot fills up very early with hikers attempting to summit Longs Peak. Dream Lake in all of its frozen beauty. If you’ve read any of our other posts on this blog, you’ve probably figured out by now that we really love to hike. If you ask me, there’s only one thing more fun than hiking…hiking in the snow! You might be thinking, “Well, no. It’s cold and difficult and boring.” Or maybe you’re thinking, “She’s crazy. Skiing is WAY better.” Before you click over to one of the six other tabs you have open right now, hear me out. Snowshoeing allows you to see familiar trails in a completely new way, it’s a challenging and rewarding workout, and it gives you the opportunity to experience popular hikes without the crowds. Oh, and unlike skiing, you don’t have to get up at 4am to do it. Snowshoeing for the win! As I’ve gotten into the sport in recent years, I’ve found it surprisingly difficult to find good information about snowshoeing near the Front Range. Don’t worry, we’ve got you covered. In this post, I’ll share everything you need to know in order to have a fantastic snowshoe outing in one of our favorite places: Rocky Mountain National Park. RMNP is a great place to snowshoe for a number of reasons: it has a pretty consistent snowpack throughout the winter months, it is significantly less crowded in the off-season, and it has a wealth of trails of varying lengths, difficulty levels, and terrain types. Also, be sure to check out our Snowshoeing Packing List to be prepared for any winter adventure!